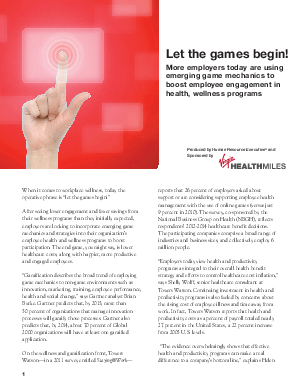 Many employers are looking to boost participation in employee health programs by incorporating emerging game mechanics and strategies. Game techniques - like challenges, rewards, competition and leadership - appeal to the players' emotions and provide a sense of achievement and pride. If designed properly, game mechanics can be successfully added into workplace wellness programs to amplify results and build engagement and excitement. "Once people start competing, there is nothing more powerful than when they realize they are making progress. And, if you reinforce that with tangible rewards, that is even better. You start with social recognition and rewards, but the highest benefit is self-actualization"
Discover more about the role of game techniques in corporate health programs in the new research paper, Let the Games Begin! You'll see how game strategies including challenges, incentives and social interaction can boost employee participation in your 2012 wellness programs.